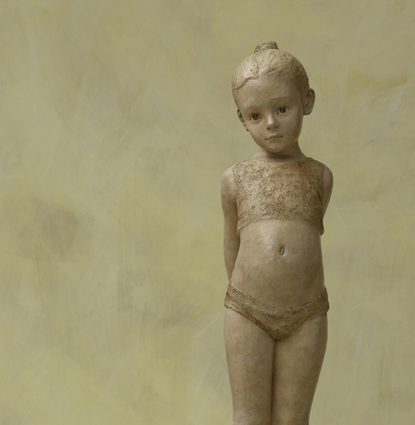 Berit’s sculptures capture the innocence of childhood. Her sculptures evoke memories of golden days, unquenched curiosity and the joy of simple accomplishments. The world seen through the child’s eye is one of wonder and beauty. If we went into the world with the ingenuousness of a child who falls asleep amid a crowd, the world could no more disturb our hearts than it weighs upon the gentle breathing of a sleeping child. As adults, we often become immune to the little miracles around us; Berit’s sculptures are touched by a magic that reminds us that the universe is still just as fascinating as when we first encountered it as children. Born in 1964 in Aaelsund in Norway, Berit Hildre is a self-taught artist who has been sculpting for over 25 years. She has lived for many years in France and currently maintains her studio in Ardeche in southern France.